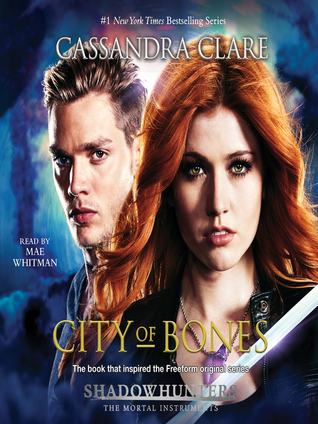 City of Bones is one of those books that I have been dying to read for quite some time but, for whatever reason, have never picked it up. I've literally owned the paperback for years but have never opened it. I decided that this would be the year that I would change that. This book was honestly everything that I expected and hoped it would be. There's so much action and adventure and I honestly saw some parallels between Valentine and Voldemort, which isn't necessarily a bad thing. There's so much to lose yourself in inside this story that I found myself instantly hooked, needing to know what was going to happen next, which creature we would learn about in the next chapter, what kind of choices the characters would have to make. There were a few things that were easy for me to figure out along the way but that didn't take away from the surprise of the situations when they actually happened. If anything it made me sad that I was right and that these characters would act in that way. I am definitely excited to read more and I'm curious about how Jace and Clary's relationship will change and grow. I'm also really curious about Bane's character. I found him extremely entertaining and interesting. I didn't pick it up for so long as well, but finally read it about two years ago. I really love the world Cassandra Clare created. I'm glad you enjoyed this one, and if you love this series overall, I would definitely check out the other books she puts out in this universe (especially The Infernal Devices).